Here's a neat trick I picked up from a scarf a friend had bought on vacation in Riga. The scarf was machine knit at a fairly fine gauge an seemed to have a hem along the two sides. But the hem was flat, not hollow--so what could it be? 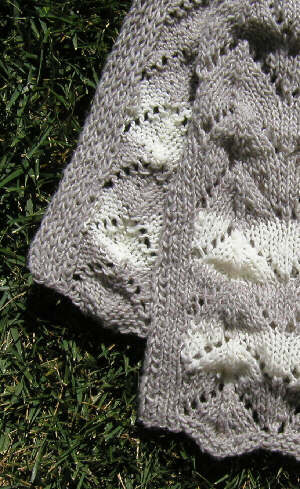 We fiddled with it for awhile before solving the mystery: it was a slip-stitch border knitted along with the scarf. Here's how it was done. Cast on the number of stitches needed for the body of your scarf or shawl, plus 16 stitches for the two borders. The "hem" will appear to be rolled to the back side of the piece. Front side: slip one stitch as if to knit, then (p1, k1) 3 times, p1, then continue across until 8 stitches remain; (p1, k1) 4 times. Back side: slip one stitch as if to purl, then (move yarn to back of work, slip one stitch as if to purl, p1) 4 times; work to the last 8 stitches; (move yarn to back of work, slip one stitch as if to purl, p1) 4 times. The one caution is that because it is based on slipped stitches, this edging does pull up a bit, as you can see in the photo. It isn't much, and blocking will probably even things out on this shawl, but on a very open or stretchy design it might not. Copyright statement: This description is by Judy Gibson . Permission is granted for any use of the instructions by anybody; however if you want to use the photo please email for permission.